Thanks for stopping back for Part 2 of todays Double Feature The Cask posts!! In case you missed Part 1 here it is: Journeyman Distillery Buggy Whip Wheat Whiskey! 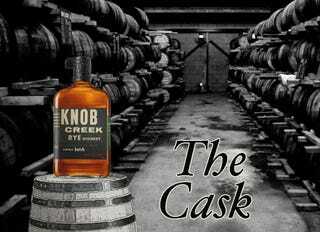 As you can see above we’re back to a mainstream distillery with Knob Creek, but for their Rye Whiskey instead of their better known Bourbon. This is officially my new favorite Rye. Yeah, that needed to be bolded. There’s rumors or at least thoughts that this Knob Creek Rye is pretty close to the minimum 51% Rye Mash and is blended quite a bit with Knob Creek Bourbon. All I can prove is that it’s delicious. You may remember I’ve reviewed a couple of other Rye Whiskey’s in the past - High West Double Rye and Bulleit Rye. Knob Creek Rye crushed them both. You’re not mixing this or making cocktails with it, this is a straight up sipper. I think the price fits the product really well. It’s a higher level whiskey without being overly expensive. Would I like it to be cheaper? SURE! But only because that would mean I could have it more often! I can officially tell you that I’ve tried the too expensive and the too inexpensive and I’m now happily sitting in the middle. I’m so glad I found the right Rye, I’ve been looking for the right one for far too long. this one is a good price for a great product and I would definitely encourage everyone to go out and give it a try! I really enjoyed this on the Rocks as well (despite the picture above being with ice) so don’t be afraid to not water it down. The flavor is great with hints of caramel. Very smooth and it actually smells a bit like bourbon when you open it. Oh, and don’t forget it’s 100 proof, so watch your pour! Thanks for coming back for part 2 of our Double Feature! I hope you enjoyed the reviews today!